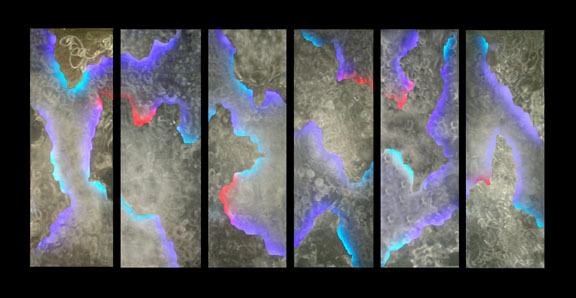 The "Realm of Neptune Series" is comprised of six panels of brushed aluminum in two layers, with sandwiched jewel-like colors of neon casting light onto the background aluminum. The nature of this work varies dramatically from day to night as the rich tones of neon cast the foreground into silohuette, emphasizing the complex, winding forms. This series was premiered as part of the "Realm of Neptune" installation, a stage set designed and constructed for a dance performance at "Level," Miami Beach, Florida in April, 2001. For views of the complete set including views of additional work and a QuickTime movie, click here.